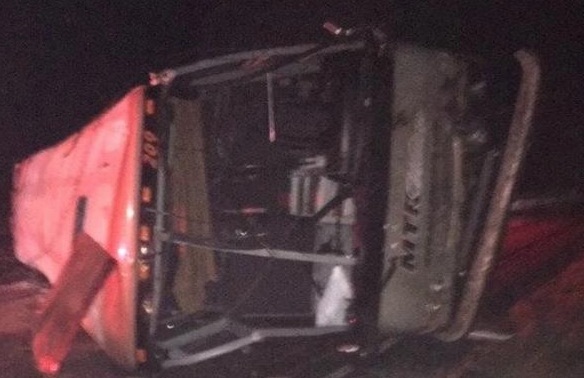 One of the charter buses carrying the University of Washington marching band to Pullman rolled on Interstate 90 on Thursday night about three miles west of George. No serious injuries were reported, but 47 people were taken by ambulance to area hospitals. Their injuries included cuts, back pain and complaints of general pain, according to a UW spokesman. There were 56 people on the bus that rolled. UW says two of the 47 remain under medical care for non-life threatening injuries. The crash occurred at 5:26 p.m. on eastbound I-90 at mile post 143. The MTR charter bus was traveling in the right lane and lost control. It struck the ditch on the right shoulder and rolled, coming to rest on its passenger side blocking the south frontage road. The rest of the students were sent on the other charter buses to George Elementary School to be evaluated by paramedics, about 280 students and staff. The band was traveling to Washington State University for Friday’s Apple Cup football game. Friday morning UW announced that the band will not continue its trip following Thursday night’s accident. The 36-year-old Sammamish woman driving the 2007 MTR charter bus was ticketed for driving too fast for the icy and slushy conditions on I-90 that evening. The citation carries a $136 ticket and a $51 collision fee. The Washington State Patrol says the woman could face additional citations pending the outcome of the ongoing investigation that could take several more weeks. The driver, who suffered injuries that were not life-threatening, was properly licensed to drive the charter bus, and neither drugs nor alcohol were factors in the crash. When you hire attorney Chris Davis (UW 1989) and the team at Davis Law Group to represent you and your loved one in a commercial vehicle accident, we will start by answering your questions and advise you on the best course of action. Your attorney will work to identify all of the at-fault parties in order to maximize you and your family’s compensation. Bus accidents can result in millions in damages, and victims are often left with life-changing injuries. Davis Law Group has been representing victims of bus accidents for nearly 25 years. A Kirkland native and University of Washington graduate, Mr. Davis knows the long road to recover can be made easier by hiring an experienced attorney to assist. Our bus accident lawyers are on-call 24/7, offer free case evaluations, and you never pay fee unless we win your case. Call (206) 727-4000, use the chat feature below or fill out the form on this page to get started. $150,000 Pre-trial Settlement For Disabled Woman Injured On King County Metro Bus Driver refused to ask non-disabled passengers to give priority seating to disabled woman. She is then injured in a fall. DLG Case #201397.